First off, if you happen to be reading this and think, "Hey, the date stamp on this article reads Tuesday not Monday," then you are very astute. Well done. This article was supposed to go up yesterday, but I ended up being busy with important President's Day things, like seeing Deadpool* and being rejected by an Ivy League university. ** So this article just plain didn't happen. Whoops. That out of the way, let's pretend this is yesterday so that we can talk about yet another iteration of black masculinity, this time looking at a hero of the Marvel Cinematic Universe and Avengers comics, Colonel James Rhodes. So far in our special, limited edition Black History Month Masculinity Mondays we've discussed characters who try to be progressive but only end up reinforcing tired racist stereotypes with Malcolm on Jessica Jones and the subversion of classic tropes about black men in positions of power on Brooklyn 99 - now we're going to look at #blackexcellence and why the hell Rhodey doesn't get more love in the Marvel fandom. Good? Good. First appearing in Iron Man, James Rhodes (Terrence Howard) is established from the start as Tony Stark's oldest and best friend. They met as roommates at MIT and have been close ever since, even though their life trajectories have led in really really different directions. Different like Tony runs a weapons manufacturing company and Rhodey is now a Colonel in the US Air Force. Still, they find time to hang out together, even if it's while Tony is demonstrating weapons for his military buyers. 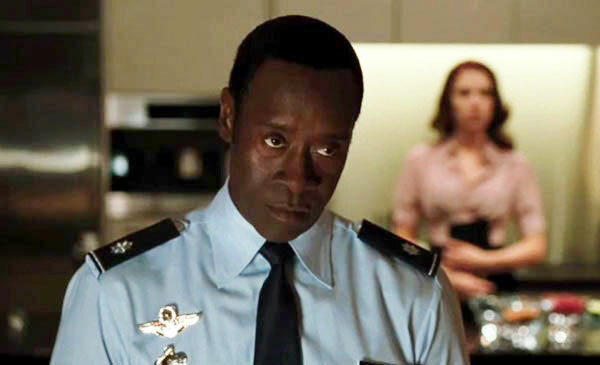 And from their interactions in the film - including but not limited to Rhodey giving a speech about his friend and trying to present him with an award only to be stood up, Rhodey trying to convince Tony to take personal security more seriously, Rhodey searching the desert desperately for his lost friend and eventually finding him, and Rhodey defying the US military to help Tony keep the suit - we get a lot about the weight their relationship has for him. Tony might not treat Rhodey well a lot of the time, but they're definitely friends. Subtextually, this first film gives us a lot to go off of about who James Rhodes really is. First off, he's a Lieutenant Colonel in the Air Force despite being Tony's age. That's not an improbable promotion rate, but it's still impressive. So we know that Rhodey is hella good at his job. We also know that he went to MIT with Tony freaking Stark, so we can infer from that Rhodey's interest in science and technology and his generally really big brain. He has to be smart to keep up with Tony, right? Finally, we get that he's loyal. Tony treats him like crap for the first half of the movie or so, but Rhodey stands by him. This loyalty is eventually rewarded, but we do get the indication that James Rhodes isn't the kind of man in it for the reward or the perks of being best friends with Tony Stark. He's seen past the facade and he knows who Tony really is as a person. That's worth remembering. 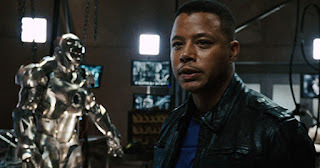 In the second Iron Man film, where Terrence Howard was unceremoniously replaced with Don Cheadle, Rhodey's character is developed a lot more. The subtextual relationship established in the first film becomes text. Rhodey loves Tony and is a really good friend to him, but he's also the kind of friend who will tell you when you're doing the stupid thing. Rhodey isn't afraid to straight up fight his best friend in the entire world when it looks like said friend is a danger to himself and others. Granted, this film also adds a lot of complexity to Rhodey's character as well. It shows him as torn between his duty to his country - the government wants him to convince Tony to sign over his rights to the suit - and his friend - he wants Tony to make good choices and refuses to use his friendship as a bargaining chip. 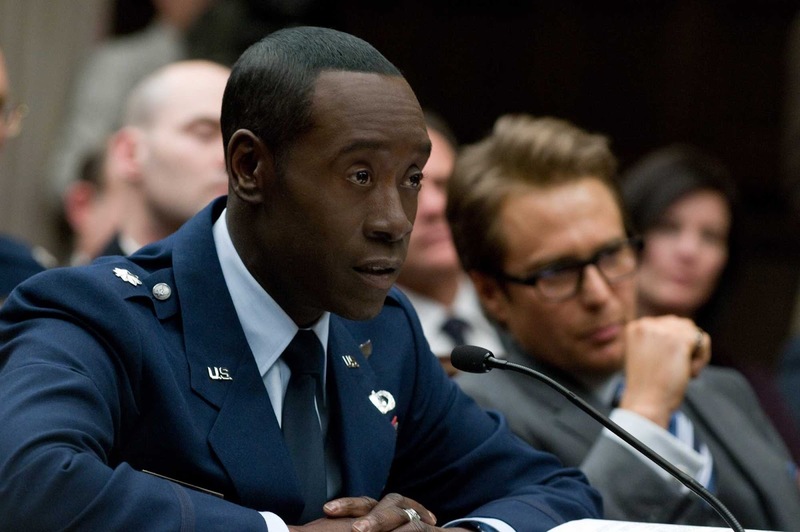 In the end, Rhodey makes his own choice, and it's his decision to neither fully take the technology from Tony nor to disobey the US government that makes him such a fascinating character. In short, while trying to stop Tony from wrecking his own house and hurting people, Rhodey puts on one of the Iron Man suits. After the fight he keeps it and allows HammerTech and the government to kit it out for him. 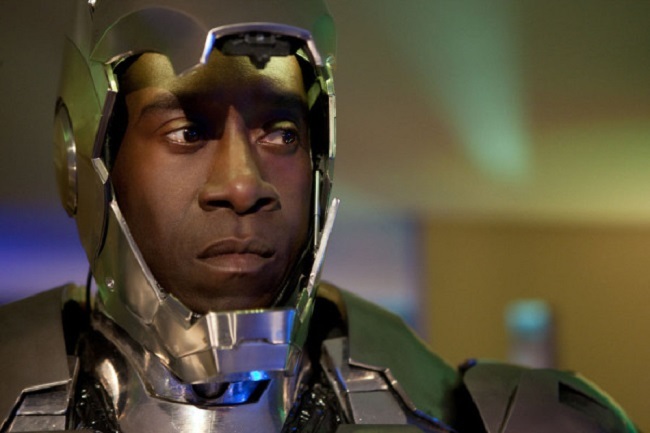 So Rhodey becomes War Machine, a superhero who both is and is not like Iron Man. I find this moment so interesting because it's a fine line to walk and Rhodey basically does cartwheels down it. 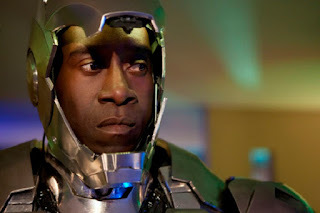 See, obviously Rhodey is like Iron Man in that he's in one of the Iron Man suits. He's effectively stolen Tony Stark's technology and is using it for government purposes. Which blows up in his face when the tech is hacked and he becomes a weapon used against his friend. But then again, Rhodey's decision to take the suit is eminently reasonable at the time. Tony is irrational and dangerous. He feels the need to protect his friend from himself, and when your best friend is suicidally depressed and has a giant robot suit, common sense suggests you get yourself a giant robot suit too. Rhodey doesn't appear again until after Avengers, in Iron Man 3, but he remains in this crux of being loyal to his friend and loyal to his country. The War Machine armor has been given a new paint job and Rhodey's been given a promotion, but ultimately he's still the same guy. A smart man doing a good job helping people. Tony makes fun of Rhodey for allowing the suit to be painted red, white, and blue and renamed "Iron Patriot". Throughout the course of the movie we see Rhodey and Tony interacting in a way that shows their relationship has healed since the second movie, but that there's still more emotional depth to plumb there. 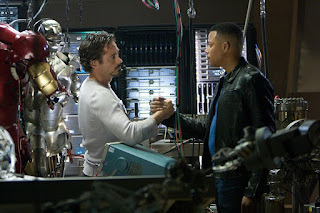 And more goodnatured ribbing - when Rhodey is once again locked out of his suit, he has to allow Tony to hack it and shamefacedly admits that his password is WARMACHINEROX because Iron Patriot is a stupid name. Mostly, though, this film shows how Rhodey will have Tony's back even if neither of them have weapons and even if they are up against a giant army of terror soldiers. He's got his back because it's the right thing to do and Rhodey always tries to do the right thing. And then in Avengers: Age of Ultron we see Rhodey a couple of times: first at Tony's giant party, then helping to save Sokovia, and finally as one of the new Avengers. Rhodey has come full way from being a side character there to establish that Tony is kind of a jerk sometimes to being a hero in his own right - I'm sure he'll have a big role to play in Captain America: Civil War this spring. Or at least he'd better. So that's a quick (or not so quick) run down of the character in the film franchise so far. But what does all of this have to do with #blackexcellence and the representation of African-American masculinity on screen? For those of you who don't live on the internet, the concept of black excellence is pretty much exactly what it sounds like. It's a celebration of excellence in the black community. Now, as I hope none of you have forgotten, I'm whiter than sour cream on a baked potato. I can't speak as someone living this experience. From what I can tell, however, the idea of black excellence is to remind the community and the world of African-Americans who are doing amazing things. The point is to shift the narrative about the black community. And Rhodey is a great example of this. James Rhodes is a genius who has chosen to serve his country as a career military man, never tries to gratuitously take advantage of his friendship with a billionaire, and who always tries to do the right thing. He's amazing. He's an example of fantastic achievement in the black community, and in the Marvel Universe we can only assume that's he's kind of inspirational. He's a big freaking deal: a black superhero and real world hero who little kids can look up to. A compassionate, intelligent black man who would much rather reason than fight but who isn't afraid to stand up to his best friend or his country when he needs to. I think that counts. As far as African-American masculinity goes, Rhodey fits some stereotypes - he's military and from a low-income background - but utterly subverts others. Black masculinity is almost never associated with educational excellence, yet Rhodey is a math and science whiz who went to MIT. He's also, according to Tony, a bit of a nerd. Far from having "street cred" or being the stereotypical black man in a movie who knows all the hippest newest everything, Rhodey is a square. He likes what he likes and he doesn't feel bad about it. Polo shirts and khakis all the way, man. This is worth representing too, this vision of black masculinity that includes mental acuity alongside physical ability. It's a reminder that black men, like men from any other race, ought to be defined not by their skin color and the associated stereotypes, but by their personalities and abilities. We'll talk more about black nerds (blerds) next week, but I really want to emphasize how Rhodey's educational status sets him apart from a lot of black men we see in the media. And, it's worth noting, while he is in the military, Rhodey is shown to be very advanced in his career and not really beholden to anyone. I mean, yeah, he has orders and follows them (most of the time), but Rhodey isn't a low-ranking soldier. He's a Lieutenant Colonel when we meet him and a Colonel not that long after. More than all of this, though, is the fact that Rhodey isn't Tony Stark's sidekick. Tony doesn't get to boss Rhodey around. Even when their friendship is at its unhealthiest, Rhodey still gives Tony flack for his behavior. He's not some yes-man or a background figure most of the time - James Rhodes is Tony's equal and the story makes sure to posit him as such. That's a big deal. I mean, it'd be a bigger deal if Rhodey got his own film franchise, but I hope we'll get there. Speaking of that, though, I want to transition quickly to talking about Rhodey in the comics, because it's actually even more impressive than his role in the films. See, in the comics Rhodey isn't just "Iron Man's sidekick" or his friend, Rhodey actually is Iron Man. Several times, sometimes for years on end. James Rhodes puts on the Iron Man suit and identity as early as the 1980s and is always shown to be Tony Stark's equal. That's a big deal and something that it bothers me to have dismissed so much. Hell, Rhodey goes on to play a big role in some of the most important Marvel storylines and even gets his own superpowered love interest in Captain Marvel. The dude's got it going on. Why then is fandom so utterly disinterested in Rhodey? That's a question I've been wrestling with recently as the MCU fandom gears up for Captain America: Civil War. The trailer for that features a shot that certainly seems to imply that Rhodey is going to die in the film, yet aside from a few pockets of fandom, I haven't seen much outrage. Like when Marvel abruptly switched actors mid-franchise, no one seems overly bothered by the idea that James Rhodes might die, and that bothers me. It bothers me because it reminds me of the deep racial double standard in fandom. While Rhodey is an amazing character, cool and smart and funny and loyal to a fault, fandom chooses to forget he exists most of the time. When writing stories about Tony, they choose to focus on his relationship with Bruce. When talking about his past, they write about his father or maybe Pepper. But almost nowhere does Colonel James Rhodes come up. He's a fantastic character who is clearly a huge part of Tony's life and yet as far as fandom is concerned, he doesn't exist. That's not right or good or even okay. And the real problem isn't that Rhodey's being left out of the fandom and not being shipped with characters left, right, and center the way you know he would be if the character were white, it's that fandom, which so often demands complex characters of color, refuses to acknowledge the characters we do get. Look. If you want characters of color, the first step is to appreciate the ones you have. From a purely capitalist standpoint, Marvel isn't going to see the point in investing in more black characters if people ignore the ones already there. But from a storytelling standpoint the issue stands: if you want to see more characters like James Rhodes, characters who are complex and subvert our general expectations about race, then support James Rhodes. I mean, we're the fandom that got Agent Coulson brought back from the dead and launched his TV show. I think we can save Rhodey if we actually try. James Rhodes isn't the best character in the world and he's not supposed to be perfect. But he is interesting and he is an example of an exemplary black man living in a racialized world. He's the kind of person I like to think we'd support if he were real, so get on that, fandom. I mean, come on. Rhodey deserves better. **Not my top choice so I'm all right, but I will admit it would have been a nice ego boost to get in. Finally, we get that he's loyal. Tony treats him like crap for the first half of the movie or so, but Rhodey stands by him. Does he ever insult Rhodey's intelligence? I can't bring him doing so to mind, and if he didn't, that's pretty much a shortlist of Rhodey, Pepper, and Bruce. He's effectively stolen Tony Stark's technology and is using it for government purposes. Explicitly stolen, since at the end of Iron Man 2, Tony says he flat out can't keep it, but he does anyway. And Tony never does anything about it (surely it would have been trivial for Jarvis to hack the suit and just fly it back, and what could the government have really done about it, given it was stolen property?). Which also means he's willing to *take* stuff from Rhodey that he wouldn't take from anyone else. The trailer for that features a shot that certainly seems to imply that Rhodey is going to die in the film, yet aside from a few pockets of fandom, I haven't seen much outrage. I have to admit, my own reaction to that is "wait, what, when?" Whatever that shot was I missed it. That aside, nooo, he must live! Rhodey and Sam are an interesting contrast, because just as Rhodey's brand of all round excellence isn't often applied to black men, neither is Sam's inclination to caregiving (service sure as hell is, but that's not a good description of the way Sam's work at the VA). You know, I think you're on to something there. I'm wracking my brain, but I can't think of a time Tony insults Rhodey's intelligence in the MCU... And Tony clearly does respect Rhodey more than pretty much anyone else, or he would have totally hijacked that armor back at the first available chance. The shot in question is one where something appears to shoot Rhodey through the chest while he's in armor, and then we see Tony cradling his body. It's all very dramatic and had better be a freaking misdirect! 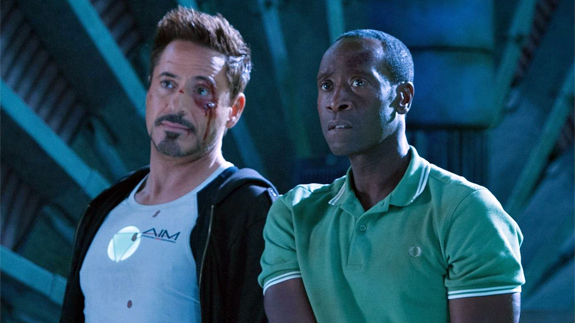 I want Rhodey and Sam to be friends and co-protagonists so bad.